What kind of person eats pumpkin pie in July? Why, my kind, of course! I don't need Thanksgiving or Christmas as an excuse to eat this great fruit, and neither should you. Pumpkin is one of the world's most mysteriously subtle, deep yet simple flavors. It deserves wider exposure. 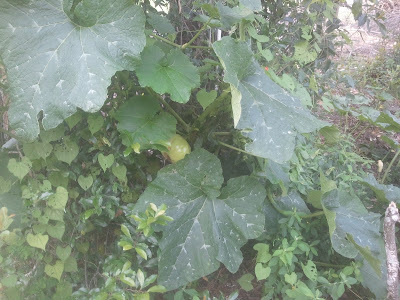 I had always thought of pumpkin as one of those classic Northern crops, but you might be surprised how well it can grow in our Central Florida Summer Sauna. After noticing it in the Southern Exposure Seed Exchange website, I chose the Tan Cheese pumpkin for a testbed, since it gets great reviews as a pie pumpkin. It doesn't look like your classic orange Jack-O-Lantern pumpkin. It is actually rather shaped like a wheel of cheese, and the skin even looks like cheese. Better yet, the texture of the fruit inside is decidedly more smooth and cheese-like than the classic orange pumpkin. So how does it handle central Florida conditions? Apparently it is pure love. I started 7 seedlings sometime in early spring, and then transplanted them to the lowest-lying, most fertile part of my yard. This section has undergone several years of gardening, layers of biochar, mulching and composting. Even so, growing many traditional crops has been a challenge there, and when summer kicks in, the only thing that seems to work there is okra. Well, now I have a second summer crop. 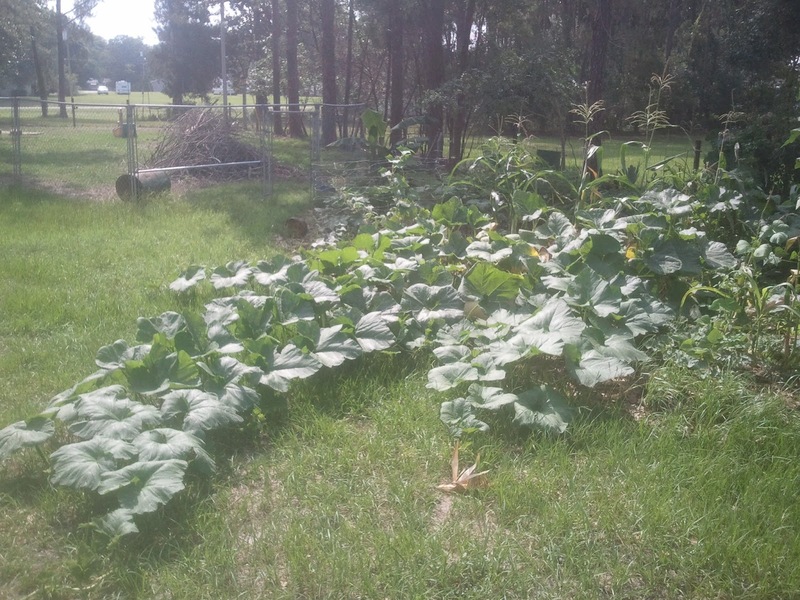 The pumpkins started slow, but by mid-summer they had branched out to cover at least a couple thousand square feet, and had produced half a dozen pumpkins weighing about 20 lbs. (enough to make 3 pies each, at least). Since then, it has produced about 10 more, and is still starting new pumpkins. This is one of the best aspects of this plant: its growing season has a wide range. So far, it has been producing pumpkins for 2 months and going strong. Here is a pumpkin in the making. 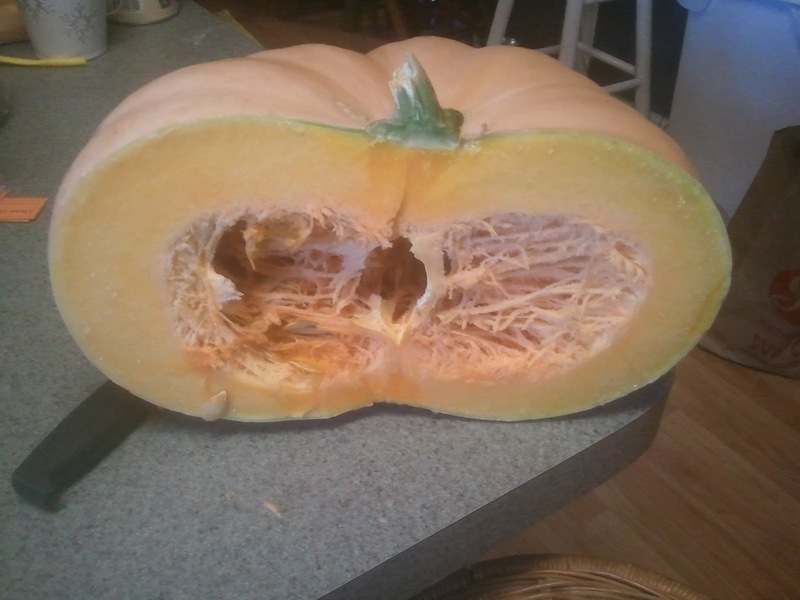 Here is a mature tan cheese pumpkin ready for harvest. Here is the author's little pumpkin holding a big pumpkin (silly face is bonus). 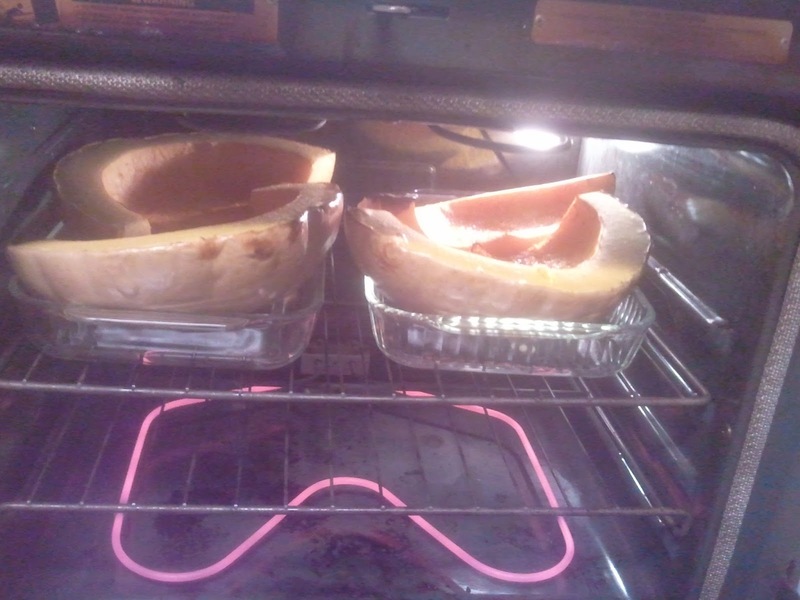 Here is a pumpkin being subjected to this wonderful recipe (prepared with a fresh milled grain crust by the author's teenage daughter). This was actually enough for 3 pies. And here is the Pavlovian result. I know your mouth just watered a little. Yes, it was delicious. But one does not have to stop at pie. 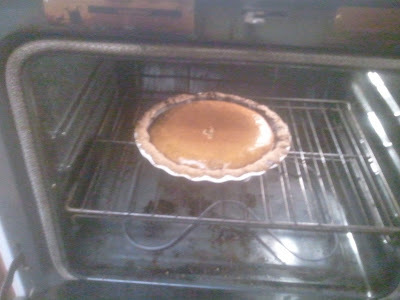 There is pumpkin soup, pumpkin bread, pumpkin muffins, iced pumpkin milkshakes or smoothies (hey, don't knock it, try it), and I have even heard that it makes a tasty replacement for mashed potatoes (See many other recipes at the pie recipe link above). Now, for those of you Paleo-, Atkins-, gluten-free or otherwise diet-modified people, don't worry. You can make pumpkin pie without a bread crust. Try using a bed of sliced almonds, for example. Or no crust. And pumpkin pie tastes great even if you cut the sugar down by half (as I prefer) and use unsweetened whipped cream on top. That, plus the eggs and milk turn it into anything but a carb bomb in your stomach. And pumpkin is actually a natural appetite suppressant. Eat something with pumpkin in it and you get a pleasant, full feeling that stays with you for hours. Also, not to be forgotten are the seeds. Pumpkin seeds are one of the world's healthiest snacks. The Tan Cheese pumpkin doesn't produce the largest seeds, but the good news is that they are so soft you don't have to hull them to enjoy them. Eaten raw, the hull is soft enough to chew easily, and if you roast them with a bit of salt (and maybe butter or olive oil), they will crunch like potato chips. 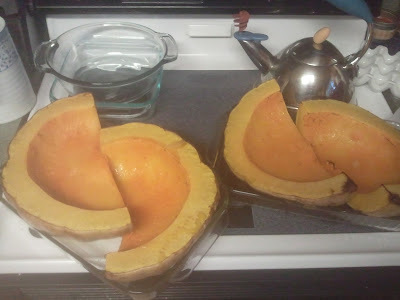 The rich orange color should clue you in that pumpkin provides a great combination of beta carotene and other vitamins. NutritiondData.Self.com, one of my favorite websites, provides you more info here. But that's only the beginning of the story. If it can be believed, just about every part of this plant is edible. 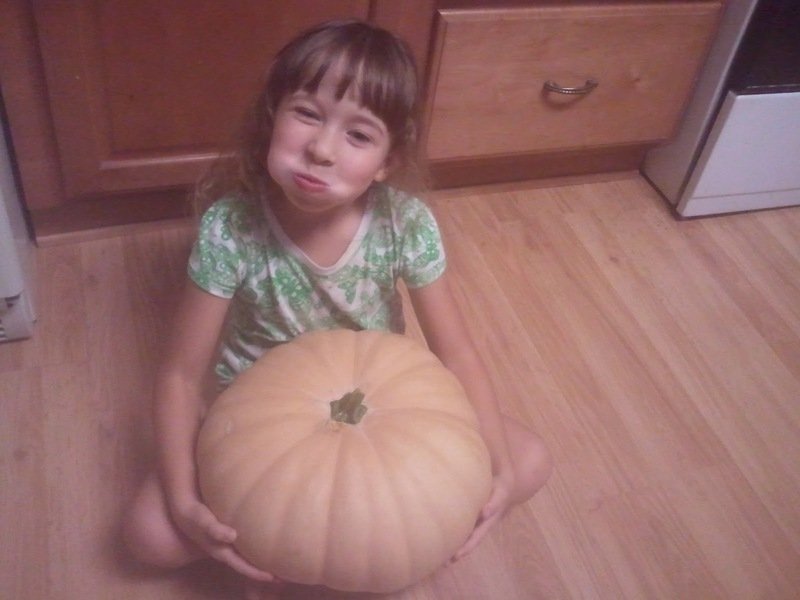 NutritionData will give you the nutrition profile for pumpkin seeds, pumpkin leaves, and even pumpkin flowers. Notice, BTW, that pumpkin leaves will deliver almost as many calories in protein as they will in complex carbohydrates. - Great cover crop if you have chickens - My lower garden patch happens to be annoyingly close to the acre field with chickens, and they are always hopping the fence to destroy cucumbers, tomatoes, sweet peppers, etc... but the worst they do with pumpkin patches is to keep the ground tilled. And, if a pumpkin splits open (happens occasionally), just heave it over the fence and the chickens will make short work of its exploded innards. - Low maintenance – Just keep the water flowing if you don't have rain. Don't worry about weeds, pests, or over-eager lawn maintenance personnel. - Good storage capacity - Pumpkins can be stored for months, unlike most other crops. Also, you can save the cooked pumpkin innards in the freezer. 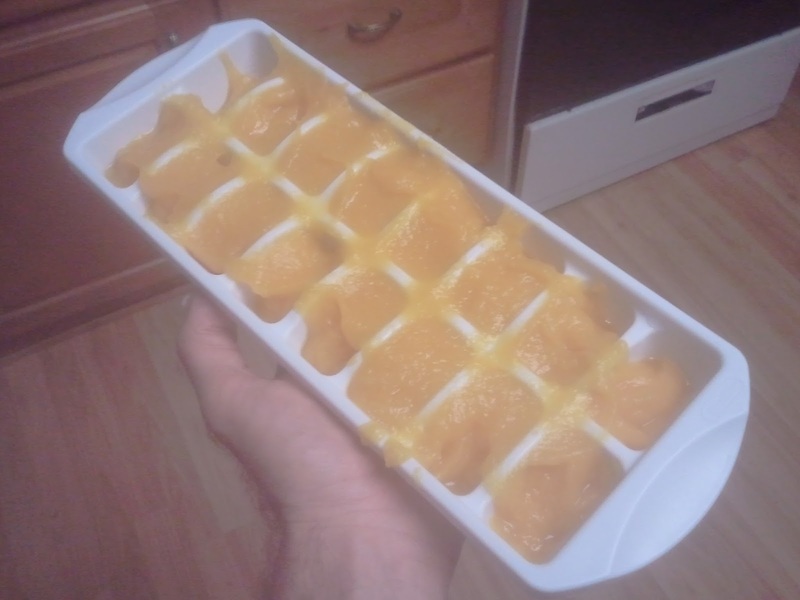 Just thaw and puree when needed. - They make great gifts - There's something about giving someone a pumpkin. - Mulch. Lots of mulch. I would recommend, in addition to well-composted moist soil, about 6 inches of leaves, wood chips or grass clippings (better yet, all three), in a wide surrounding area around where you will plant your seedlings. - You pretty much can't give them too much water. This is why they are great for the Central Florida monsoon season. It seems that the sky hangs onto the water for about 8 months of the year, and just lets it go in a huge sigh of relief for 4 months. - Remember that they don't like to stay confined. The tendrils will grow, by my reckoning up to half a foot a day, in every direction. So give them space. If you plant them close to some sensitive crop, be prepared for the pumpkin leaves to swallow it up. In this picture you can see that it left my garden and struck out a good 20' into the lawn on one side, and started growing up the trees on the other side. I had one pumpkin start a good 5' up in the air. Later, that same tendril went a good 15' up this tree. 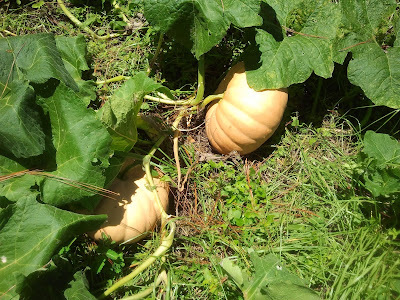 - Make sure that, even though you are providing lots of water, soil drainage is such that the pumpkins don't sit in muddy water for more than a couple hours at a time. Central Florida's sandy soil helps in this regard. - Having trouble finding your pumpkins? Wait until the height of noon on a hot, dry day. 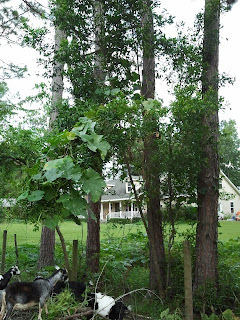 All the leaves will wilt down and suddenly every pumpkin is visible.